There are many different parties which can be held legally responsible for the damage caused in any hydroplaning accident. 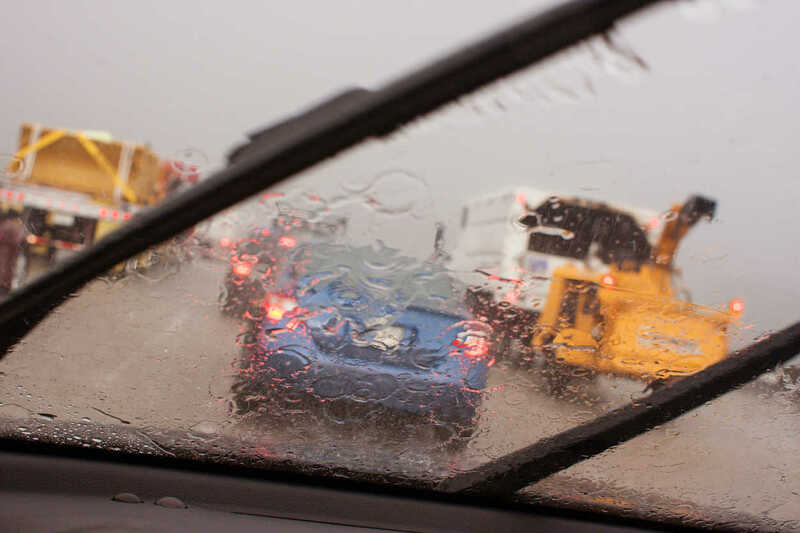 Accidents caused by weather conditions are often out of our control. During rainy season, hydroplaning accidents are quite common. If you have been injured in a car accident due to hydroplaning, there are plenty of options to claim compensation for the damages incurred. On wet roads, the drivers of cars, motorcycles, semi-trucks, and pickup trucks tend to lose control over their vehicles and cause accidents. This is known as hydroplaning. In such situations, the tire of the vehicle has to disperse a huge quantity of water which is beyond its capacity, this builds pressure and forces the water to flow under the tire. Consequently, a thin layer of water separates the tire from the ground. The vehicle loses its grip on the road and the driver is not able to apply the brakes, use the steering, or control the automobile in any way. Usually, such a vehicle starts spinning and is prone to hit other cars, trees, road signs, or any other structure on the roadside. The problem of hydroplaning occurs on all wet roads. However, this issue gets aggravated when drivers choose to travel at high speeds. In order to avoid these accidents, you should drive slowly in a low gear, and switch off cruise control. Moreover, do not apply brakes suddenly, and avoid sharp turns. Another safety tip is to drive on the tracks left by the tires of other vehicles which are moving ahead of you. Take good care of your vehicle and keep it fit with up-to-date maintenance and servicing. Check the tires regularly, and see if they are inflated properly. Do not hesitate to change or replace them if required. Tires which are not pumped up sufficiently or lack tread depth are the most common culprits for hydroplaning accidents. All these precautions can go a long way in reducing the risks of hydroplaning. There are many different parties which can be held legally responsible for the damage caused in any hydroplaning accident. The liability of these parties can be verified with the help of statements made by the witnesses, authentic declarations, reconstruction of the accident, and reports issued by law enforcement. The other driver: The sad part of hydroplaning is that more than one driver can lose control of his vehicle at the same time. This often makes the situation even worse. Each driver is partially responsible for the mishap. So you can claim the compensation after deducting the percentage of your fault. The owner of the vehicle: If you were driving someone else’s vehicle and the accident is caused because the vehicle is not in a good condition, the owner of the automobile could be held responsible for it. Such a situation may arise when you borrow your friend’s car. When you drive your employer’s automobile for business purposes and face such an accident, workers’ compensation may reimburse the damage. The tire manufacturer: Hydroplaning is commonly caused due to the use of faulty and substandard tires. If you provide an evidence that the poor quality of the tires was the reason for the accident, you may be able claim reimbursement from the manufacturer. The agency responsible for the maintenance of the roads: In case the calamity happens due to the deplorable condition of the road, the government agency in-charge of looking after the roads is considered accountable, because holes, cracks and broken surfaces of the road hinder the driver during hydroplaning. The compensation for a hydroplaning mishap may include the medical expenses incurred in the past and the future, the loss of income, and also the accompanying suffering and pain. However, it may not be easy to get the damages that you deserve. So, it may be necessary to seek the assistance of an experienced St. Louis auto accident attorney. Give The Hoffmann Law Firm, L.L.C. a call 24/7 at (314) 361-4242 for a free case evaluation.